Sasha was our loving friend, never failing partner and fearless defender. She was loved by all who met her. We miss her deeply and hope we were worthy of the devotion she gave us her entire life. 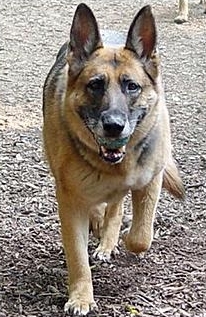 Sasha was an exceptional German Shepherd Dog. Black and red in color and large for a female, Sasha was originally trained as a police/patrol K-9, and was also excellent in tracking. She was trained as a narcotics detection dog in 1999, and certified by the West Virginia Police Canine Association. She re-certified yearly until the age of 10. Sasha was an active indicator. Dogs that are active indicators usually scratch or bark to show where the narcotics are or were hidden. This girl was very smart and didn't waste much time. She worked quickly and was always ready to play! Her Kong was her obsession until the very end. 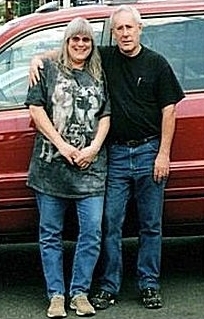 My glue boy, constant companion and "activities director" who always had a game to play and something to say. Fiercely protective and never out of sight there will never be a more dedicated and loving friend. He loved his tennis balls and had one in his mouth at his last breath. Stuka was truly one of a kind whose body gave out long before his mind and his spirit. STUKA was a black and red German Shepherd Dog. 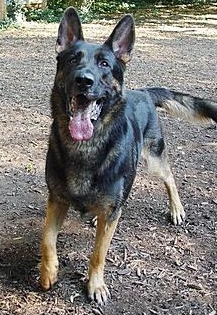 He was one of six pups that Sasha gave birth to on December 5, 2001. An extremely intelligent, a very, very focused dog, with an unending desire to work or play, he loved to stay busy all the time and seemed to never tire. STUKA certified in explosives detection at the age of 7 months, also through the West Virginia Police Canine Association and re-certified yearly. His first job was sniffing over 1500 parachutes for explosives at Bridge Day 2002 at the New River Valley Gorge Bridge in Fayetteville, WV. He was trained as a "passive indicator", meaning he sat quietly when he detected the presence or residual odor of explosives or explosive components. His name, Stuka comes from the word "Sturzkampfflugzeug", which in German means dive bomber (literally: plunging combat aircraft) from the famous WWII german aircraft. 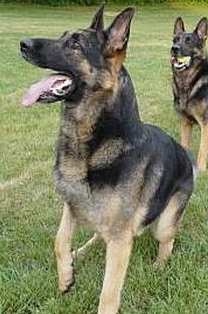 Jaeger was a black and tan German Shepherd Dog. Another of Sasha's pups born December 5, 2001, he was a big, beautiful boy, kind of goofy, but always happy and friendly and very willing to please. Jaeger certified in narcotics detection, just after his brother, through the West Virginia Police Canine Association and re-certified yearly until his retirement. He was also trained as a "passive indicator" and he sat quietly when he detected the presence or residual odor of narcotics. Jaeger could detect all the basic categories of narcotics; marijuana, cocaine, methamphetamine, heroin, opium and many prescription drugs including oxycontin. "Jaeger" is the German word for hunter.